Creating organized and innovative lesson plans is an essential part of every teacher’s job. However, finding the time and the motivation can be difficult when you’re also trying to grade homework, attend meetings, and manage classroom projects. With the help of Gynzy and your interactive whiteboard, you can cut down on the time required to write your lesson plans so you can focus on your students’ education. We made a number of template pages that can help you reduce the amount of time for creating your own interactive lessons. Below are seven tips that will help you get started! Providing classroom quizzes is a great way to evaluate your students’ level of understanding and help them retain important information. The use of Gynzy ready-to-use templates and your smartboard can help you reduce the amount of time it takes to create these quizzes. 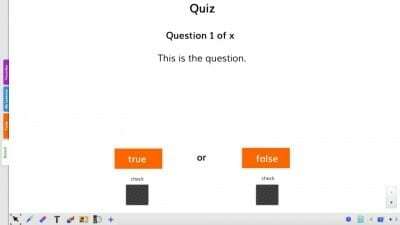 For example, the Gynzy Quiz Question, Quiz Question True/False, Quiz Question A, B, C, or D, and Quiz Question Open templates allow you to customize your classroom quizzes to fit the curriculum and education level of your students. These quizzes can be utilized at the end of subject units or even as reinforcement throughout each chapter. You can also use the Gynzy quiz templates to create an interactive learning environment where material is reinforced through playing games. Divide your class into two or more teams then display one of the Gynzy quizzes you’ve created using your smartboard. Set a timer (or use the Gynzy Timer) and tell each team they must answer when it is their turn before the time is up or the question goes to the opposing team. The winning team can be rewarded with five minutes of extra recesses, free reading time, or a trip to the class treasure chest. Incorporate the Gynzy Drag Into 2 Groups template to help your students compare and contrast different topics or items. Many students learn best when they are required to identify similarities and differences in the words or items they are studying. As they group like things together, they begin to build a mental list of characteristics for each category. This template can be used during class as a whole-class activity or in centers for break-out groups. As students sort the items or ideas into two separate columns, they will begin to apply their knowledge of the subjects to find similarities and differences. This will help to solidify their understanding and reinforce the concepts being taught. 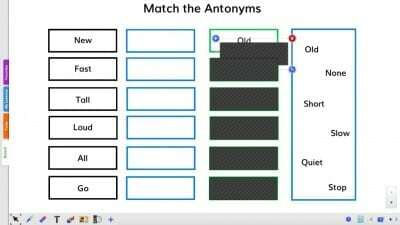 Use the Match Words template to help your class understand concepts such as synonyms, antonyms, definitions, and even equations. Create your own customized list depending on the subject you are teaching. For example, provide your class with a list of spelling words and their corresponding definitions then have them correctly pair each together. For math lessons, create equations with corresponding answers then have your class solve each one in order to correctly match them with their solutions. You can also create lists of synonyms or antonyms to teach your class about words with similar or opposite meanings respectively. Regardless of the topic you are teaching, providing your class with a matching activity will allow them to further explore the subject and reinforce their understanding. It can be incorporated into your lesson plans as a class activity, class quiz, center activity, or partner game. You can also give your students a chance to design their own match game by having them work in small groups to create their own lists with corresponding answers. Have groups exchange lists and correctly pair the other groups’ items. 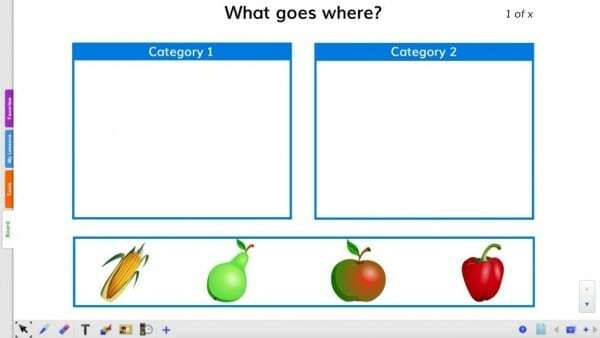 The Gynzy template, Connect the Items, for your interactive whiteboard is an excellent activity for younger classrooms or for ESL groups. 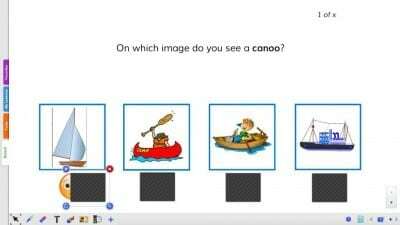 This activity allows your students to match pictures with their correct words. In addition to helping your class name new items, students will also become familiar with the proper spelling of each item as they connect the correct word with the picture. 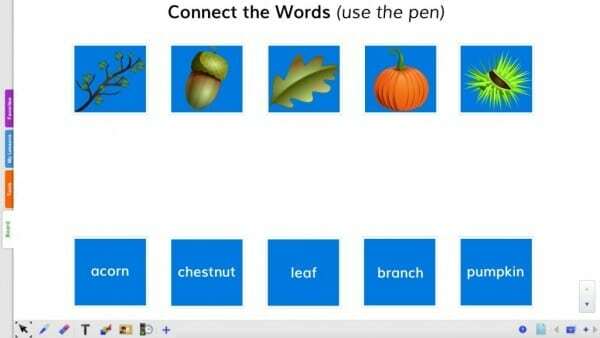 In addition to using this tool for English vocabulary building, the Connect the Items application can also be used to teach foreign languages. Simply replace the English word with their equivalent in your desired language to help students begin to build their vocabulary in a second or third language. This activity makes an excellent small group or centers activity and helps to reinforce vocabulary through words and pictures. Spelling is an important part of your lesson plans regardless of the grade you teach. Give your students a chance to succeed on their spelling tests and build their spelling vocabulary by utilizing the Gynzy Spelling Practice 1 andSpelling Practice 2 templates for your interactive whiteboard. These spelling templates allow you to stimulate your students’ minds on multiple levels as you display a picture that represents their spelling word. 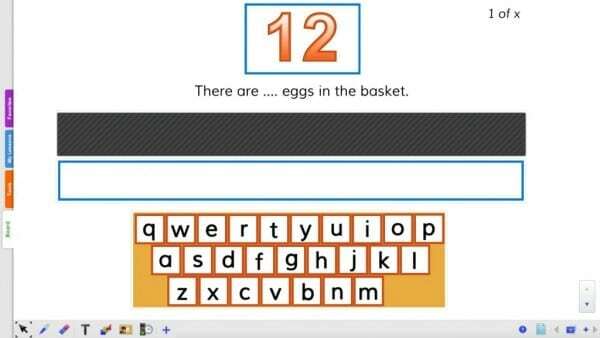 Your students will then need to convert the image to the proper spelling word before providing the correct spelling. This activity can be used as a whole-class activity, as a partner activity, or during centers in order to reinforce their spelling list. The use of images will further solidify the spelling in their minds as they associate a picture with the proper spelling. With spelling being an almost daily part of your lesson plans, you can change how this activity is used each day so that students have the opportunity to use it in both larger group and smaller group settings. 6. Create Lesson Plan Layouts. Gynzy and your interactive whiteboard can help you create individualized page layouts for each subject and for each part of your lesson. 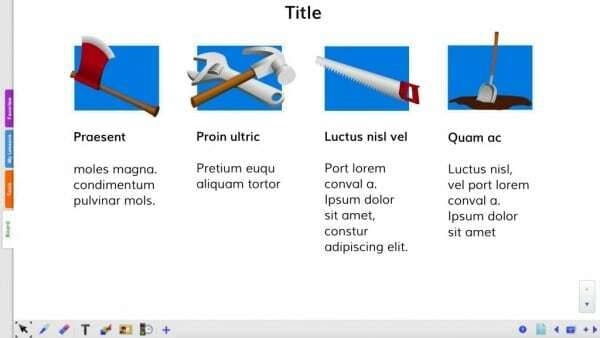 The Various Text Layouts template allows you to choose from templates where you can include videos, multi-media applications, images, and text to bring your lessons to life. Select the template you desire to use then upload the video or image that corresponds with your lesson. Add important facts, vocabulary, or information to support your images and help your class learn on multiple levels. Using the text layout template allows you to stay focused and on track throughout your lesson. Scroll through one page after another to discuss each section in detail to provide your class with a consecutive look at the topic being taught. This teamplate works especially well for science, environment¸ social studies, and history topics where images and videos can help to deepen student understanding. Schedule time in your lesson plans to allow your students to work independently with the Gyzny Independent Learning Timer. This timer gives you the ability to assign set periods of time for each independent activity then counts down until the time is up. For example, following a lesson on writing summaries, give your class fifteen minutes to read an assigned story, five minutes to write an outline, and twenty minutes to write the complete summary. The Learning Timer will keep track of each time period and will alert the class when it’s time to switch activities. Incorporating independent learning time into your lesson plans helps your class learn to stay on task and focused in order to complete an assignment on time. It also encourages them to learn independent work and study skills that they will need as they progress through each grade. Upper grade classrooms may benefit from independent learning time at a set hour each day with specific assignments to be completed each time. Lower grades may like to utilize independent learning time for shorter intervals once or twice a week. Regardless of the grade or subject you teach, creating lesson plans using the examples of Gynzy template for your interactive whiteboard will allow you to make the most of your time. These templates will also give you the opportunity to incorporate games, multi-media applications, images, and sounds to help your students remain engaged and enhance their understanding of the subjects being taught. Using the seven tips listed above will allow you to spend less time planning and more time teaching so you can help your students reach their educational goals.